Concrete pump also call towable concrete convey pump, it is consist of pump body and conveying pipe. The concrete pump use press to continuously convey concrete along with pipe, mainly used for building, bridge and tunnel. Gaode Equipment Co., Ltd is a China concrete pump manufacturer. In order to avoid kinds of operate problem during working, let us show how to operate concrete pump. (1) Max aggregate size, the No. Of cement and proportion of mixture, please meet the mechanical property of the China concrete pump as per user manual. 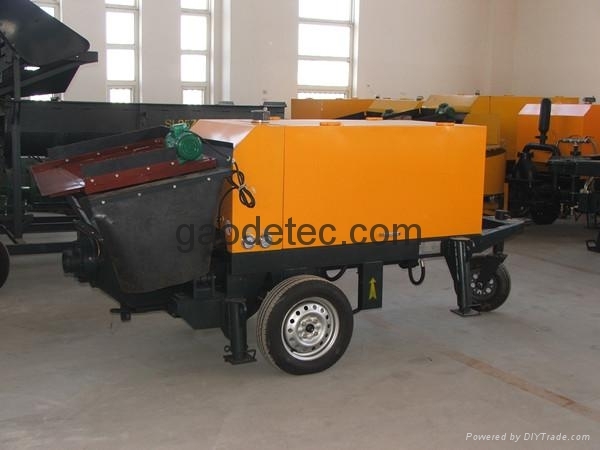 (2)Brake of concrete pump for sale should be used together with lock brake at the same time, wheels should be fixed tighten, normal water supply, water box should be full, nothing in hopper, all the lubricating point should be normal. (3)The each bolts of concrete pump equipment should be fixed, joints of delivery pipe should be fixed and sealed, and protect device should be safety and reliable. (4)All the parts should be on the correct location, including adjustment handle, hand wheels, control rod, screw stopper, etc. hydraulic system should be normal, without any leak. (5)Cleaning pipe and cleaning supplies are ready. Pipe must be lubricated use required cement sand before working. Irrelevant personnel should far away delivery pipe. (6)All the legs should be extended and fixed, don’t star before unfixed. (7)Kinds of instrument and indicator light should be freely monitor, find any abnormal, should adjust and solve it at once. If delivery pipe is block, should drive reverse concrete pump, make concrete back to hopper, the blocked pipe should be tear down if it is necessary. (8)Don’t open any delivery pipe and hydraulic pipe when pump system is accepting pressure. The safety valve of hydraulic system can’t be adjusted freely. Energy accumulator just fill in nitrogen. (9)After work is finished, concrete in the hopper and pipes should be outside, then cleaning pump, hopper, pipes. The outlet of pipe don’t have any person within 10m when using compressor air to clean pipes, and collect all the plastic bubble and small stone by metal net. (10)After finished, kinds of operate on/off, adjustment handle, hand wheels, control rod, screw stopper should be return, and hydraulic system with unloading.